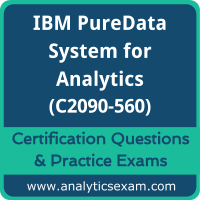 This page is a one-stop solution for any information you may require for IBM Certified Specialist - PureData System for Analytics v7.1 (C2090-560) Certification exam. 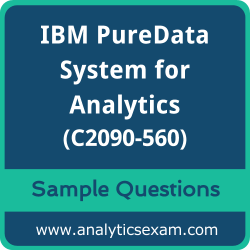 The IBM C2090-560 Exam Summary, Syllabus Topics and Sample Questions provide the base for the actual IBM PureData System for Analytics v7.1 exam preparation, we have designed these resources to help you get ready to take your dream exam. The IBM Certified Specialist - PureData System for Analytics v7.1 credential is globally recognized for validating IBM PureData System for Analytics knowledge. With the IBM PureData System for Analytics v7.1 Certification credential, you stand out in a crowd and prove that you have the IBM PureData System for Analytics knowledge to make a difference within your organization. The IBM Certified Specialist - PureData System for Analytics v7.1 Certification (C2090-560) exam will test the candidate's knowledge on following areas.